This week, I took a vacation for the first time in 6 months, and coincidentally this will also be my first blog post about IMmerge in 6 months. During some downtime on the plane, I decided to whip out my laptop and figure out what is needed to get IMmerge finished. There’s nothing quite like breaking your daily routine to get you kickstarted on some new (or old) projects! Question: Would you rather wait until the incoming/outgoing feature is finished, or is it acceptable to skip it for the first beta? Here is a summary of new features to expect in the next major version of IMmerge, 1.0. The most obvious change from the user’s perspective is the introduction of a GUI at last! No more having to move and rename your log folders, as you can now select folders with your mouse. This is written in Java Swing and will use native look-and-feel of your OS where available. (I suggest you keep Java up-to-date. Many GUI improvements were made in Java 6.) 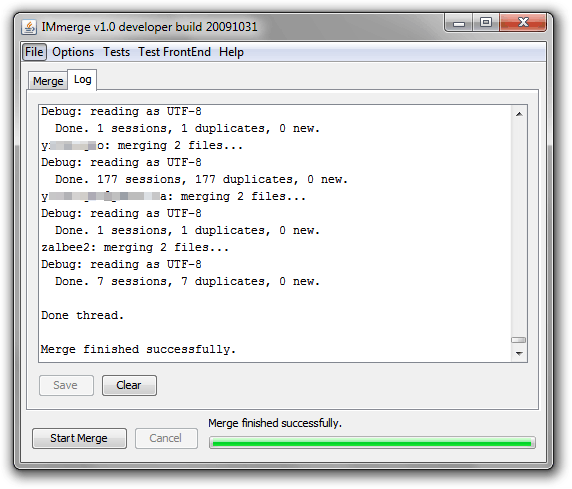 It is also threaded properly so that if the merge operation errors or hangs (*knocks on wood*), it won’t take down the entire program. 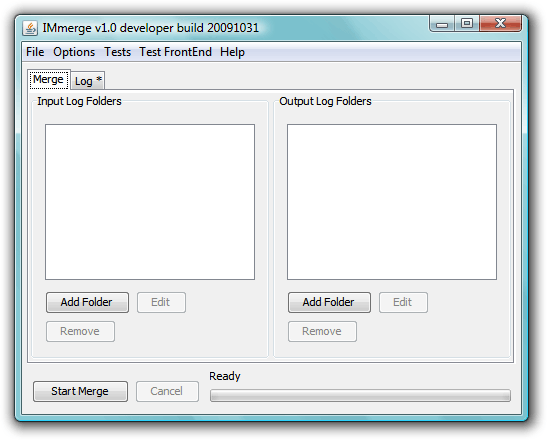 A log of IMmerge’s actions will be available like before. Trillian, the multi-protocol instant messenger client that IMmerge was originally written for, is currently selling its 4.0 Pro version for $10 instead of the regular $25. That’s a pretty good deal. For paying, you get new theme colours, a very nice history viewer (from 3.0), access to the Flash-based web client, and other goodies. I can attest that this is a good program, as it has been my main IM client on Windows since 0.74 and I have personally reported >25 bugs (at least 20 fixed) into Astra’s bug tracker :). Now for the real reason to start a blog… Here is a taste of things to come! To answer some quick questions: It will still be in Java and hence still be cross-platform, but with native look-and-feel (pictured on Vista). Also, this is a working version, not a mock-up. 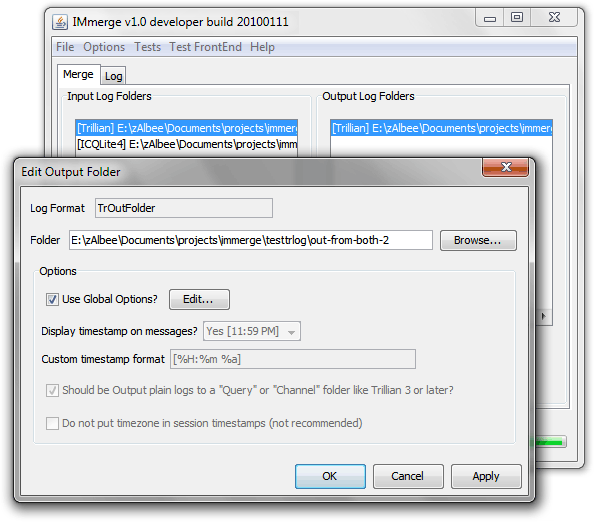 IMmerge is a program that I wrote in my spare time — a small command-line utility for merging IM logs (mainly Trillian). This could have easily been a throw-away program to forget about (the source code for the currently released version is shamefully unmodular! ), but over the years I have maintained, supported, and added features to it. Unfortunately, I had left the website in this simplistic state. It is time to update the website, which has been decidedly Web 1.0 for too long now. I still believe that having static webpages is the best way to provide information to new users, and I will continue to support this. However, the user input available through blogs and forums is too valuable to continue missing out on. So here we go — a blog to provide news and updates on ongoing development, and hopefully gain some user insight.